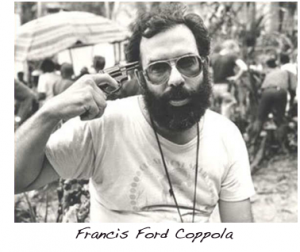 I worked with Coppola in post production on the Godfather. Paramount insisted on using the world-class film processing company, Technicolor, and I was lucky enough to be asked to join the team. I was charged with keeping track of each and every scene of the movie, while Francis and a “color timer” corrected the “sepia tone” color of each scene. It was a 4-month gig, on what would turn out to be the greatest film of all time. I was 23. At one point Francis told us the story of while they were in the throes of shooting, he was constantly being threatened and challenged by the producers to keep the production “under budget,” or “why did the dailies look so crummy?” or “why can’t he stay on schedule?” etc. He said directing the film was a huge challenge itself, let alone dealing with the suits. In fact, rumor has it that he was once in a bathroom stall when he overheard two guys talking about how terrible a director they thought he was. He says that he lifted his feet because he was afraid they would recognize his shoes. Leads me to the question, what stops you? Do You Stop when others criticize your work? Do You Stop when personal “doubts” begin to surface? Do You Stop when there’s too much work involved? Do You Stop when the money runs low? Do You Stop when it’s too time consuming? Do You Stop when there’s too much stress? Does your resistance to today’s technology stop you? Does your resistance to social networking stop you? Does your resistance to the “new industry” stop you? Does “not being good at marketing” stop you? Does doubting your own talent stop you?